A new campaign has been launched calling for a law to protect every child’s right to a father. 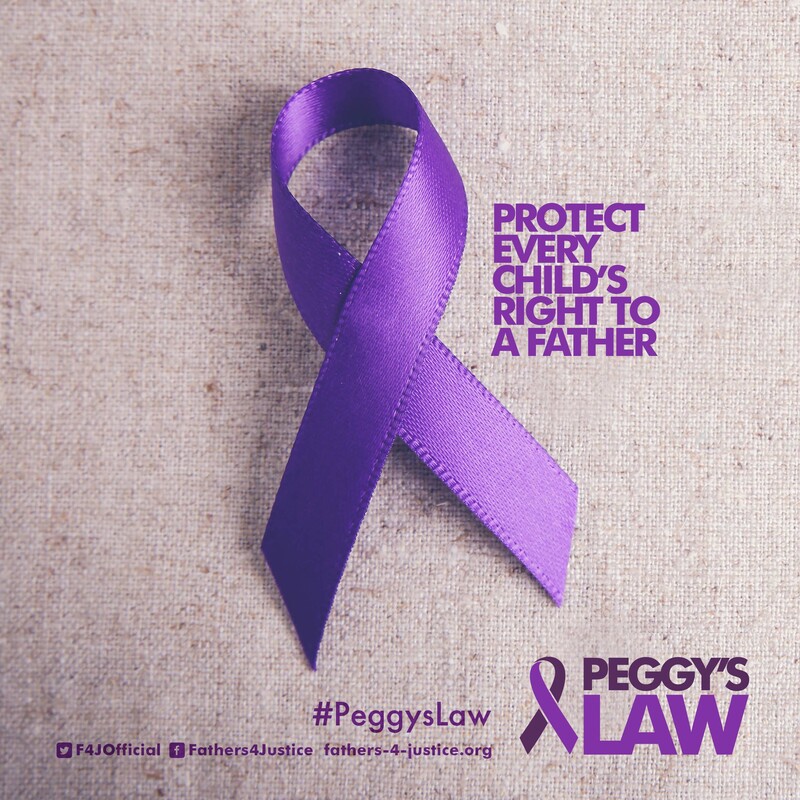 Peggy’s Law is the first nationwide campaign from Fathers4Justice and will use the hashtag #PeggysLaw and a purple ribbon to symbolise the plight of the 3m children living in fatherless homes and the 200 children who are forcibly separated from their fathers every day in secret family courts. 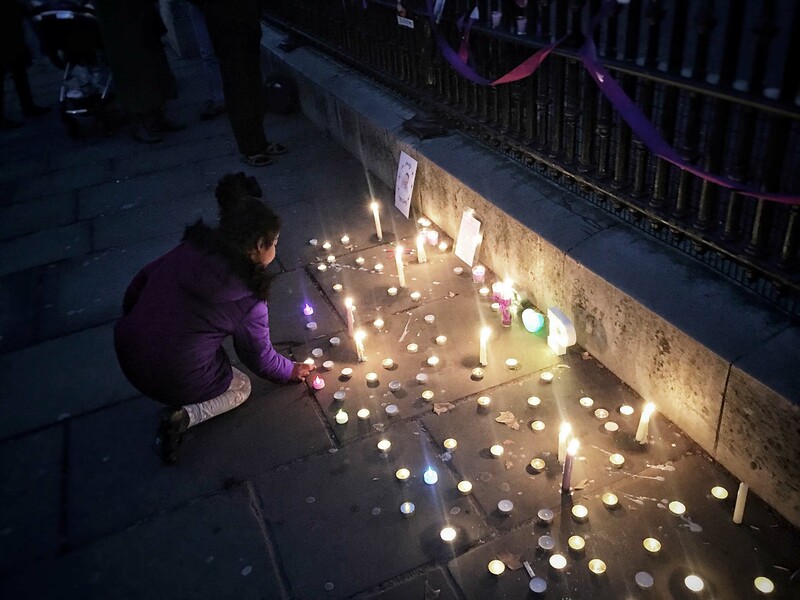 A candle-lit vigil at Buckingham Palace at 5pm on Valentine’s Day, on 14th February, will bring parents and grandparents together, who will tie purple ribbons and pictures of their children to the railings, and light candles of hope and remembrance. An online petition will also be launched calling for Peggy’s Law and the introduction of 50/50 shared parenting. The campaign, named after the daughter of dad and F4J ambassador Kris Donnelly, aims to end the cancer of fatherlessness and give every child the love and support of both parents when growing up. 2) WEAR YOUR PURPLE RIBBONS / TURN YOUR STREET PURPLE! 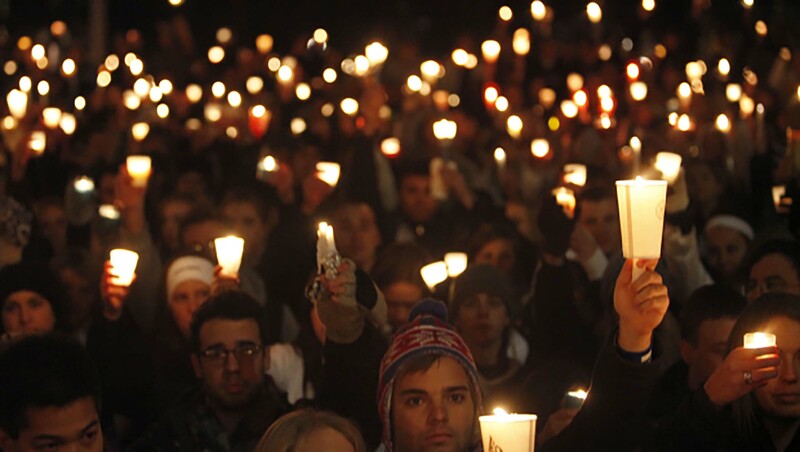 * Share the ribbons amongst family, friends, neighbours and colleagues and ask them to wear them. Explain the campaign to them and how important it is to you and your family. * Remember to always wear your purple ribbon to court and when you visit your MP. * Tie purple ribbon around a tree, gate, bush or lamppost outside your house to symbolise your missing child or grandchild. You could also attach a weatherproof laminated picture of you children. * You could even paint your front door purple! * Contact your local press and encourage your neighbours to tie ribbons in solidarity. 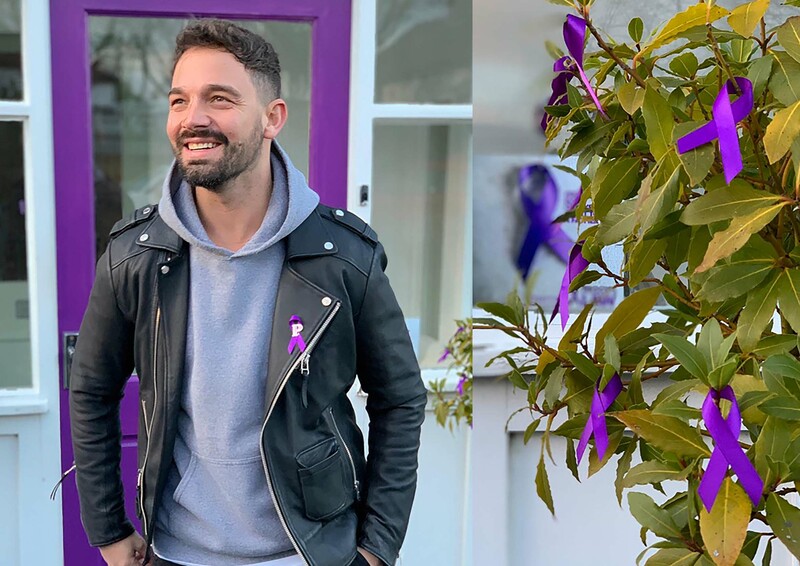 See if you can turn your street purple for Peggy! Apart from natural law rights, a child’s right to both parents is enshrined in various human rights acts and conventions. 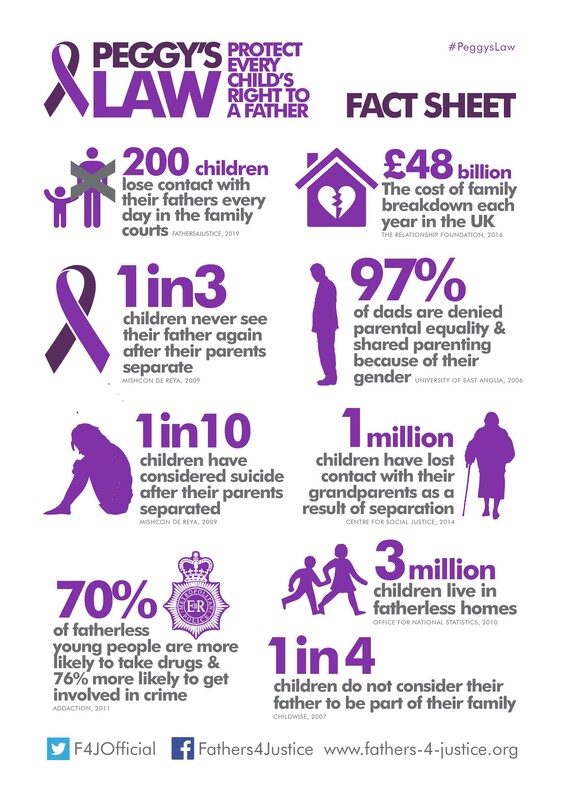 Under the current UK law, there is no ‘legal presumption to contact’ between fathers and their children, only a right to apply to a court for a Child Arrangements Order. This is a prohibitively expensive, protracted, and dysfunctional process that reverses the previous ‘presumption of contact’ into a presumption of ‘no contact’, where the burden of proof rests with the father (to prove contact is safe) and where every father is automatically risk assessed by the court. Grandparents need leave of the court to make an application for a court order for contact. 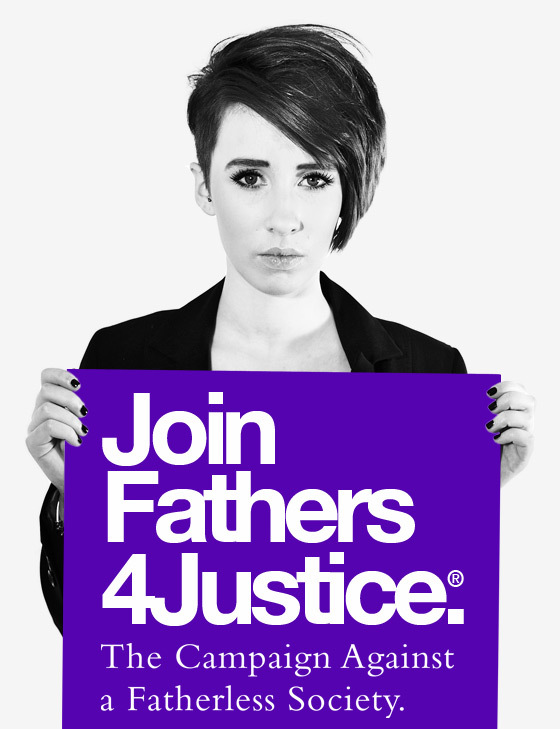 Successive governments have broken promises made to F4J to introduce 50/50 shared parenting and give grandparents rights. UN Convention of the Rights of the Child: Every child is entitled to protection from abuse and emotional harm and has the following human rights. Article 8: “ ..governments should respect children’s rights to a name, a nationality and family ties. Children Article 9: “..children have the right to live with their parent(s), unless it is bad for them. Children whose parents do not live together have the right to stay in contact with both parents, unless this might hurt the child. 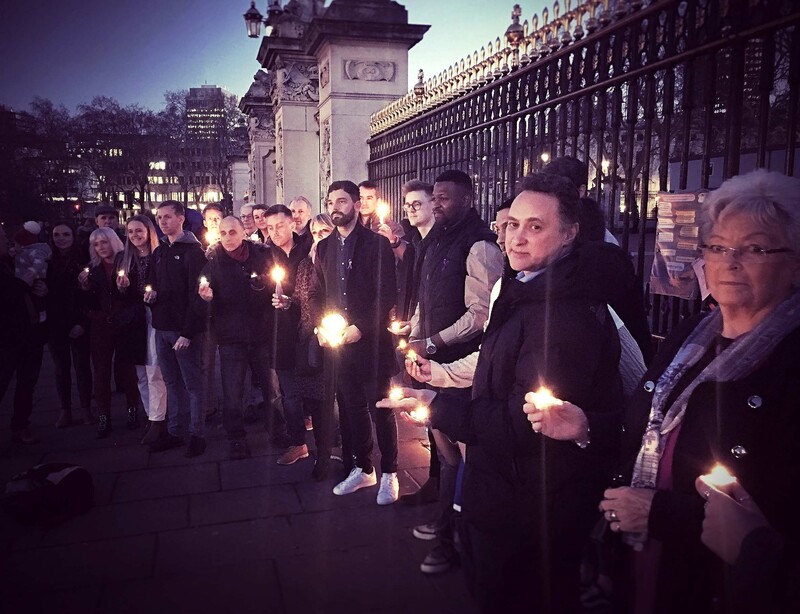 Buckingham Palace has been a place of protest for F4J since 2004. It is not only an iconic venue, but it is also the London residence and administrative headquarters of the monarchy. The task of administering justice in the UK is carried out by members of the judiciary acting in The Queen’s name. The Royal Coat of Arms appears in every courtroom in England and Wales, demonstrating that justice comes from the monarch and a law court is part of the Royal Court. Judges and magistrates are Her Majesty’s judges and magistrates, and they are official representatives of the Crown. Everyone is to show respect for the Queen’s justice and the Sovereign is required to cause law and justice and mercy to be administered to all.